Cerro de la Muerte is the highest point in the Costa Rican section of the Inter-American Highway. Its name means "Mountain of Death" or "Summit of Death," since in the past crossing the mountains from the Valle Central meant a three- or four-day journey, on foot or on horseback, and many ill-prepared travelers succumbed to the cold and rain. However, the peak is now easily accessible since the highway runs close by. A drivable track from the highway (Kilometer 89) leads to a peak, with its cluster of telecommunications aerials. A short hike is also available from the highway to another peak marked with a barrel. A sign marks the high point of the highway (Costa Rica 2) at 3,335 meters (10,942 feet), from where the vehicle track and hiking trail begin. At this altitude, overnight temperatures can dip below freezing, but the sun soon raises the temperatures in the morning, with a high risk of sunburn in the thin clear air. Record temperatures reach below -6°C. 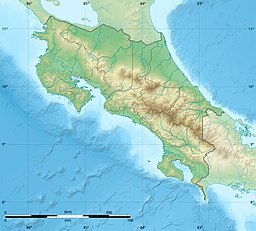 This mountain is in Talamanca range, which extends from eastern Costa Rica into neighbouring western Panama. This range was a volcanic island in the geological past, it raised result of tectonic uplift and its separation from other mountain ranges means that it has developed many endemic species of animals and plants, often with affinities to Andean forms. The higher areas are páramo habitat, with stunted shrubs, dwarf bamboo, and tree ferns, and smaller plants like blueberry, gooseberry and lady's slipper. Below this zone, the natural vegetation is oak forest with bamboo understory, an excellent place to see the charismatic resplendent quetzal. Nearly 50% of the bird species recorded from Cerro de la Muerte are endemic to the Talamanca range. These include fiery-throated hummingbird, timberline wren, sooty robin, black-billed nightingale-thrush, peg-billed finch and volcano junco. Because crossing Cerro de la Muerte took up to five days on foot, at the beginning of the twentieth century, three resting stations were created by Congressional Decree Number 45, signed on August 5, 1908. Between 1910 and 1912, the three resting stops, known as houses, were built; "División", "La Muerte" and "Ojo de Agua", at a cost of ₡1,749.47. They were built at intervals of about 10 to 12 hours of hiking from each other. There was a rule of leaving firewood ready for the next guest. ^ ¡A remozar el Monumento de Ojo de Agua! Wikimedia Commons has media related to Cerro de la Muerte. This page was last edited on 31 May 2017, at 22:43 (UTC).